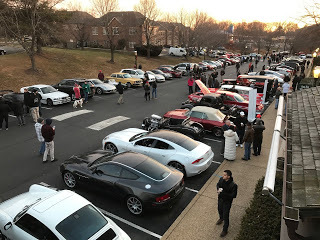 New Year’s Eve morning of 2016 found the Drive Home II caravan on the road at 5:45 a.m. winding its way through northern Virginia toward a Katie’s Coffee and Cars event in Great Falls. Still dark when we arrived at 6:15, the parking lot was already filling up with classics, hot rods and exotics. The folks at Katie’s gave us prime parking spots for the 300G and Nomad, and Dale unloaded the Crane-Simplex as well. 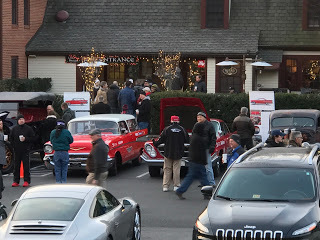 By 7 a.m. some 100 cars had shown up along with families and enthusiasts, many of whom said they were following our exploits on social media and the ACM Web site. Katie’s Coffees and Cars has been a weekly event for the past five years, and in the summer we’re told it’s not unusual for 400-500 cars to show up. A few hours and some miles later we connected with a dozen or so motor aficionados who came out to meet us for lunch at the Prince Street Café in Lancaster, PA. The cars included a ‘62 Chrysler 300, a ‘60’s Rambler, and a ‘70’s Z-28; additionally, there was a mid-40s Pontiac gangster-style coupe with a violin case/fake tommy gun on the back seat and whose driver was decked out in mafia-wear that included a black overcoat and hat and white wing-tipped shoes. After a good lunch, the troupe traveled with us for a good ways toward our next stop in Allentown, PA. Charlie, the driver of the ’62 300 that he lovingly called Marilyn (named after Marilyn Monroe), followed us all the way to Allentown even though he lived about an hour in the opposition direction.